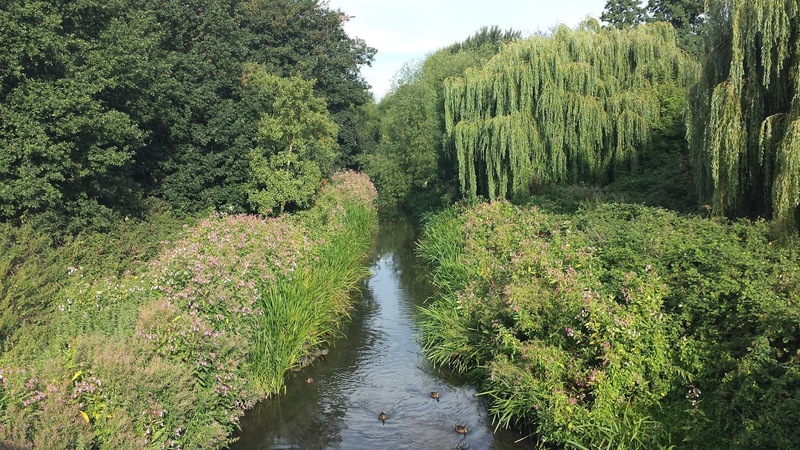 Deep in west London there is a river called the river Crane, and at a certain section around its banks is a park which is named after this narrow channel of water. 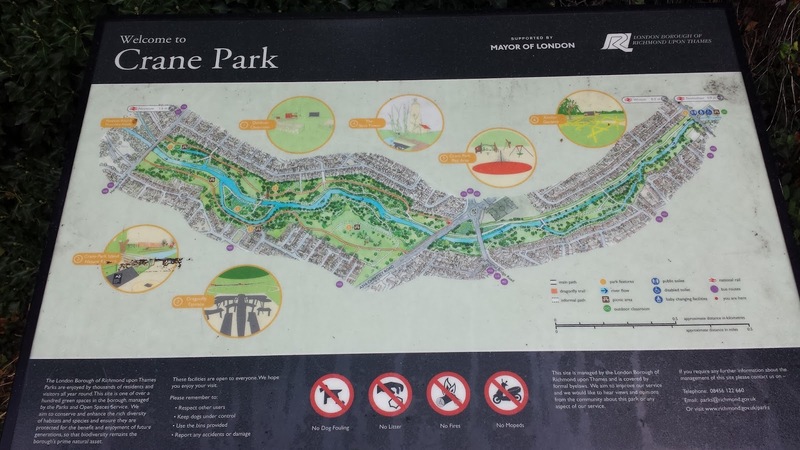 The river cuts this park in two and acts as a boundary between two different London boroughs. On the Northern side of the river you have Richmond and on the Southern side, Hounslow. 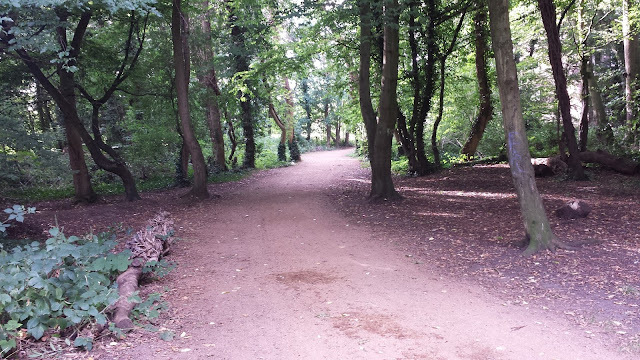 A former use of the land was as a Gunpowder mill and you can still see the remains of this as you run the course. There is also a nature reserve which is on an island between two channels of the river. They say that the reserve is home to a thriving colony of Marsh Frogs and the rare Water Vole but despite looking I didn't manage to spot either when I was having my pre-run wander along the banks of the river. In the days leading up to my visit, I was desperately trying to find some information on bicycle parking but none seemed to be available (Richmond and Hounslow both have web pages on the park but didn't cover this subject). 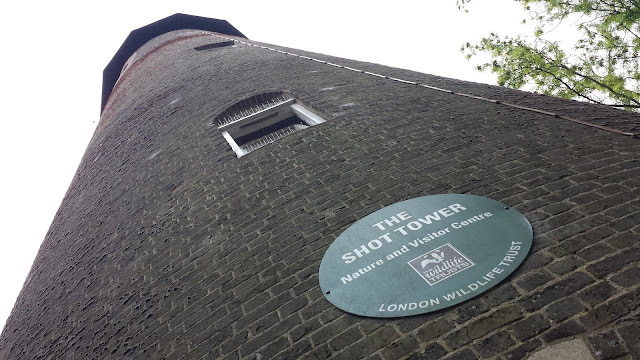 Anyway, now I've been there I can tell you that there is a set of cycle racks - to find them you need to go into the Northern half of the park and find the shot tower (a relic from the park's gunpowder producing days) and you'll see the racks right next to it. By train the nearest stations are Whitton (London) and Fulwell, but they'll both involve an extra bit of walking or jogging to reach the park. There is no car park here. Looking at google maps you could probably probably park on one of the side streets. 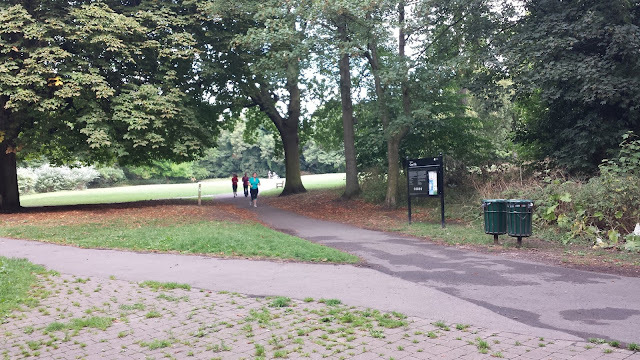 If you follow the advice on the Crane parkrun webpage and park on Meadway you'll have to leave yourself enough time for a nice stroll along the river to reach the start line. The advantage here is that you'll apparently have access to toilet facilities. If you look at the map above you might be able to make out the Dragonfly Trail - The run follows this route and the toilets are right over on the eastern edge of the park (I didn't go that far over so am unsure of opening times etc). There are no other toilets in the park, so if you head straight to the run and find that you are desperate, your only option looks like going 'back to nature'. I may or may not have taken this option. So, the run. It's a one-and-a-half-ish lap course which starts at the playground in the southern half of the park and is run in a clockwise direction. 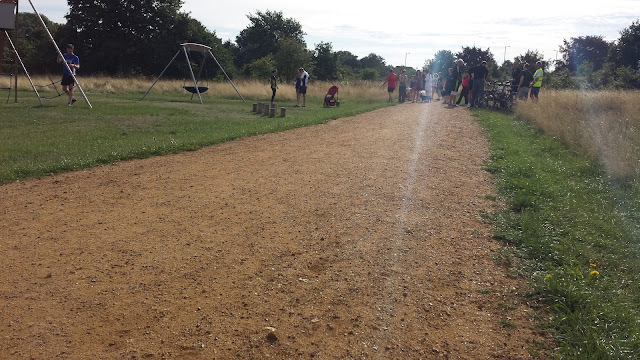 While in the southern half the course is run on a dusty, mildly gravely surface (similar to Bedfont Lakes parkrun) which meanders through the trees and along the river until you reach the exit. 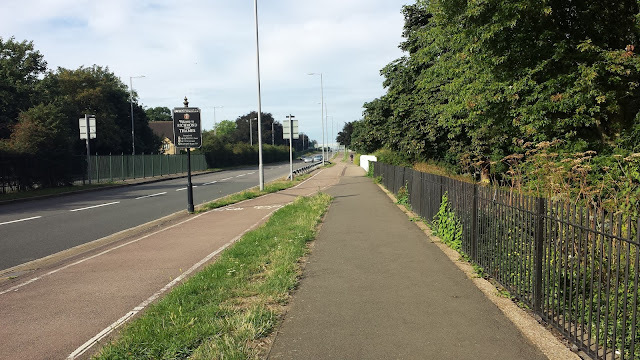 At this point you turn right and run along Hounslow Road, which crosses the river. 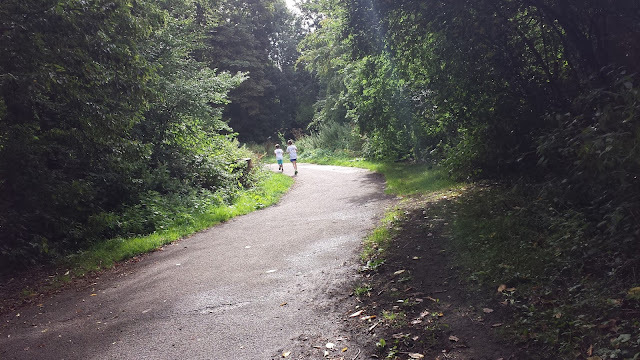 A few metres later the route enters the northern half of the park, here you run on tarmac paths. 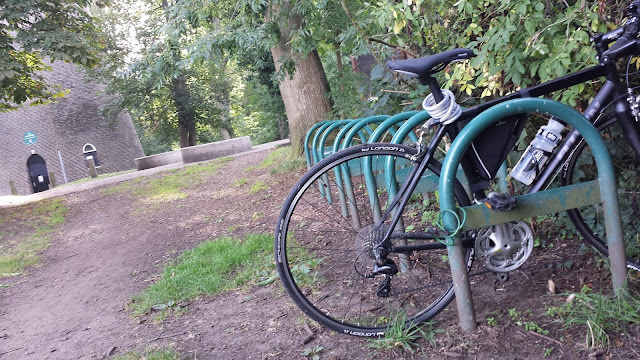 Again the route meanders through the trees and passes the shot tower, where I have a glance towards the bike racks to check that bike is ok - it is, but is the only one there - it seems that most runners have used the fence at the Great Chertsey Road entrance. After running 2 kilometres you will pass the finish area (it probably won't be set up at this point, but don't worry - it will be when you come back around!). This time you just keep running until you reach the opposite end of the park, where again you leave the park, turn right and run along the Great Chertsey Road, again crossing the river as you do so. Shortly after turning back into the southern part of the park you'll pass the start line, this is the 3 kilometre point so is a good place to glance at the watch to see how things are going. If you're anything like me you'll divide your total time by three to find out your kilometre pace and then try to work out your approx finish time. Then again if you have a fancy pants GPS watch that tells you all of this you'll miss out on the fun of on-the-go maths! From here you'll follow the previously run route until you come back around to the finish line, which will be glaringly obvious as you'll see a number of markers (are these things cones?) 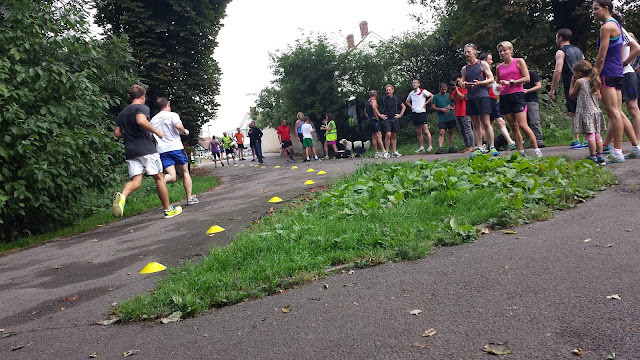 along the ground to direct you towards the timekeeper and the finish token giver-outerer. It's a lovely, tranquil place for an early morning run, the course is fast and flat, the locals are very friendly and the volunteers, as always, are brilliant!